Welcome to the NEW DCS WebStore! 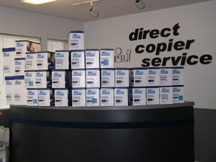 We have a wide variety of supplies and parts available for your office equipment. This site is "contract friendly". If your contract with DCS covers supplies, your price will reflect this. Use the "Quick Find" search box on the left to find your item OR use the "Make/Model" menu to find your machine. If you don't see what you are looking for, please contact us and we can get it for you. Be sure to check back often, as we will be updating this site constantly.